Quality and tone at an affordable price is the hallmark of our F series guitars. Yamaha guitars have passed lots of quality checking process and strict quality tests.These works are leading to high durability and stability. These guitars share every bit of the passion that ignites our premium ranges and are the perfect instrument for student or seasoned player alike. 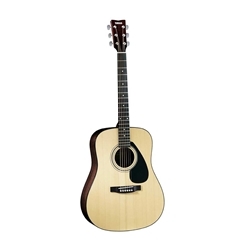 The F1HC is a great acoustic guitar package that includes a premium solid top folk guitar (FD01S) with a deluxe plush harshell case.